For more information, or to order tissues, contact Rajan Shukla with Stephens Instruments. The halo sterile tissue line ushers in a new era in glaucoma and corneal surgery. It is shelf-stable and can be stored at room temperature. It is ready to use and requires no rinsing or rehydration, making it ideal for both emergency procedures and scheduled surgeries. Available in cornea, sclera, and pericardium, Halo tissue is available in whole and precut segments. 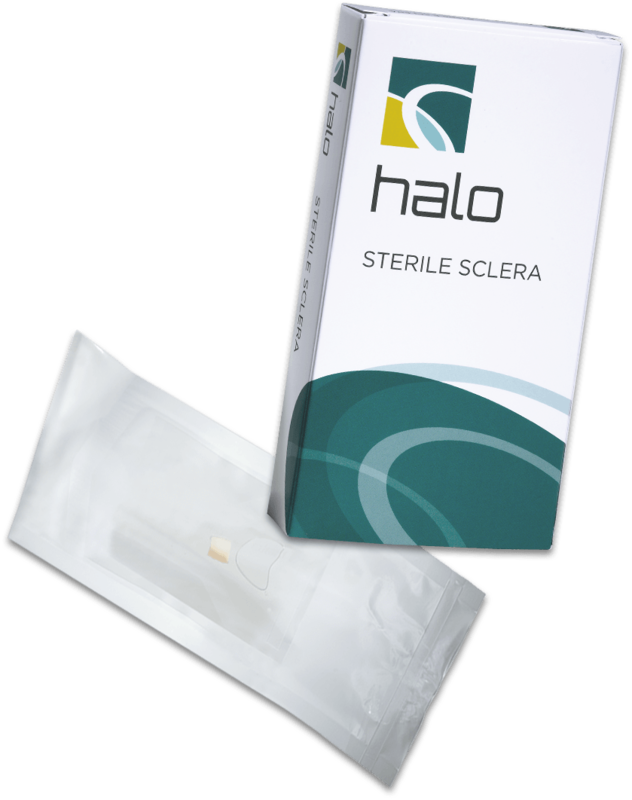 Halo Sterile Tissues use E-Beam Sterilization to achieve industry standard sterility of 10-6, but in a fraction of the time of traditional methods. The reduced processing time benefits tissue efficacy and sterility by limiting the environmental exposures tissue encounters during processing. Every aspect of Halo has been designed for the modern OR from processing and preservation, to packaging and pricing. Halo Sterile Tissues come in efficient packaging with sterile, peel-packed tissue contained inside slender boxes perfect for storage. Tissue can remain at room temperature and never needs reconstitution, so you can always have tissue on hand for scheduled or emergent needs. Halo Sterile Tissues have been created to meet all your emerging ocular surgery needs. Halo tissues are available in Cornea, Sclera, and Pericardium. Corneas available in both half and full thickness. Lions VisionGift is both a procurement organization and research facility that provides tissue to surgeons and researchers. We have become a leader of corneal transplant safety and efficacy thanks to our world-renowned Vision Research Laboratory, a quality assurance lab established to improve the condition of donor tissues and safe tissue processing. Our mission is to help advance the science of ocular medicine by developing and evaluating innovative techniques and procedures, while promoting safe eye banking practices through rigorous quality assurance research. Accredited and certified by the Eye Bank Association of America and registered with the U.S. Food and Drug Administration. We are licensed in several states, including Oregon, California, and Maryland, as well as Canada.